Margaret June Roach, 95, born on June 11, 1922 in Roanoke, passed away Saturday, May 26, 2018. 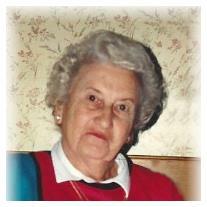 She was a resident at Richfield Nursing Home and a member of Emmaus Road Community Church in Salem. She was predeceased by her parents, the late Herbert and Irene Wright; husband, Lawrence H. Roach; son, David Wayne Roach; daughter in-law, Karen Roach. Surviving to cherish her memory are her daughter, Betty Adams (Gerald) of Roanoke; son, Bob Roach (Eunice) of Salem; sister, Jean Roberts of Penhook; grandchildren, Pat Hogan, Glenn Roach (Nikki) of Caldwell, Idaho, Rob Roach (Kelly) of Bent Mountain, Ken Roach (Tammy) of Roanoke, Danny Kane (Sonja) of Salem, Diane Holt (Michel ) of Callaway, Donna Blankenship (Ted) of Salem, Nicole Kessler, twenty great-grandchildren and seventeen great great-grandchildren.